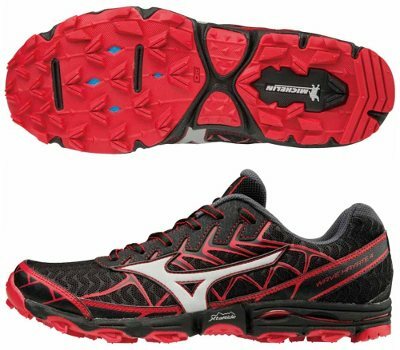 Mizuno Wave Hayate 4 are neutral trail running shoes. After many changes in previous editions, it looks like Mizuno Wave Hayate 4 finally consolidates all solutions that seem to work fine. The boom experienced by trail running (offroad racing in general) during last years has made several brands to look into specific market ruled by few manufacturers like Salomon with its S-Lab series and La Sportiva with its beautiful Bushido, so Mizuno with its Hayate saga and Brooks with Mazama 2 have introduced some fresh air and lower prices into such competitive segment trying to gain some market share. There are not many changes compared to its predecessor Wave Hayate 3 and this is definitely good news because it confirms both Mizuno and runners (who pay for them) are satisfied with performance. Besides modern and attractive design, new upper configuration of fused elements over revamped (more durable) mesh and increased heel padding work together to keep everything in place for improved, tighter fit. The other major change is the partly gusseted tongue to prevent dust and debris from jumping inside. Rest of Wave Hayate 4 remains the same with simple but effective midsole (used as well in its bigger sibling Wave Daichi 3) based on reliable AP+ (no U4ic or U4icX yet) and expected concave Wave™ featuring limited cushioning and great stability. In a similar way Wave Mujin 4 does, there is an specific rock plate (ESS) in the forefoot to prevent stone bruising. No changes as well in outsole which has been built in collaboration with renowned manufacturer Michelin, taking advantage of its experience in off-road tyres with specific rubber depending on the area for increased durability and prominent lugs placed in aggresive configuration for enhanced traction. Xta Groove (XtaRide™) in midfoot provides extra flexibility by enabling some decoupling between front and rear zones for uneven ground adaptation.